Deceived by Satan into rebellion against God. Being critical of leaders’ imperfections. Being offended, although that sounds a lot like “pride” to me. Rationalizing disobedience, i.e. wanting to sin. Didn’t pray or read the scriptures enough. Wanted to cover up some dark deed. Maybe all of those are valid reasons. I have never been a bishop or stake president, so I’ve never heard any confessions or had any experiences with those reasons. What I do know is why I left, and why thousands of people like me have left. My simple reason for leaving the LDS church: I studied church history and I no longer believe the church is true. I’m not sure how to make it more clear than that. There are thousands who have left the church because they no longer believe it’s true, as evidenced by the many online communities, podcasts and blogs for those disaffected with the church. There are reasons besides church history that people decide the church isn’t true, but in my experience church history is the most common reason. Now, I know there are people who learn what I’ve learned, and decide the church is still true. Or, they say maybe the church isn’t the one true church, but they see enough good to stay. Or, they love the community, and they want to stay to be a part of it. I love all my family and friends who are still in the church. If it works for them, I’m happy for them. I’m not angry or resentful that they believe in the LDS church. Having spent 43+ years in the church, it was a part of my identity, and still is to some degree. I spent countless hours serving, from my two year mission to many church callings. It was a very large part of who I was. Turning away from that has proved to be painful, because a change of that magnitude is never easy. At the same time, I feel like my ability to empathize with others has never been greater. I am more tolerant of other ways of living than I ever have been before. My mind and understanding are growing, which is an exciting thing to experience. Am I happy that I left the church? I’m happy I found what for me is the truth about the church. I would have been happier if I could look at the church and say it’s true after all I learned, but I can’t do that. But ultimately I am happy I took this path because I know it’s what I needed to do. For me, one of the worst parts of leaving the church is being misunderstood. I have some friends who left the church last year for the exact same reason I did. But, I had never heard that not believing in the church was a valid reason to leave. So I thought about all the other reasons I had learned about (see the list at the top of this post), and I assumed they must have had a problem with one of them. When I realized I was leaving the church for the same reason they left, I felt sorry I previously didn’t understand them. And now I know people misunderstand my motives as well. 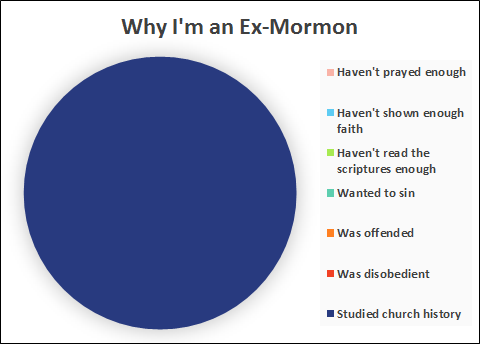 There’s not much I can do to explain why I left without making it look like I’m recruiting people to leave the church. I made a post on Facebook where I announced I no longer believe in the church. I wrote the post because so many people were asking my wife or asking our friends what was going on. I didn’t spell out any of the church history issues, because my post wasn’t intended to prove I was right. I tried to explain I didn’t believe in the church anymore and that I’m doing fine, as are my wife and my kids. I asked for mutual respect and continued friendship, which is mostly the response I saw. I don’t know if any active church members believe I could honestly decide the church isn’t true and just walk away, but I’m guessing a lot of people think I’ve gone crazy, or that I’m hiding some dark secret. The best I can do is to continue to live a good life, to take care of my family, and to continue with the same morals I’ve always had. For some reason I really like this topic, so I’ll comment. I don’t think there’s ever really a single “reason”—when the shelf breaks, which book do you blame? That said, there’s definitely sometimes a primary reason (an Encyclopedia Brittanica). For me, Church history was just a small part of my disaffection. I was more influenced by the Church’s harmful doctrines/policies and by my own bad experiences with Church leaders. So yes, I was “offended” which apparently is a bad reason for leaving, but I think it’s legitimate. I don’t ever again want to be in a position where a self-righteous old man I didn’t even elect can screw me over. Thanks for your comment, Tom. People do leave legitimately due to bad experiences like yours. What I don’t like is how the church minimizes being “offended” by telling stories like the milk strippings. It makes it sound like people only get offended over silly things. Thanks for commenting, Stef! I’m always interested to hear other people’s stories. I’m glad you felt like you got to a point where you could be honest with yourself. It’s not easy for everyone to get there.